General William Howe, 5th Viscount Howe, KB, PC (10 August 1729 – 12 July 1814) was a British Army officer who rose to become Commander-in-Chief of British forces during the American War of Independence. Howe was one of three brothers who had distinguished military careers. In historiography of the American war he is usually referred to as Sir William Howe in distinction to his brother Richard, who held the title of Lord Howe at that time. Having joined the army in 1746, Howe saw extensive service in the War of the Austrian Succession and Seven Years' War. 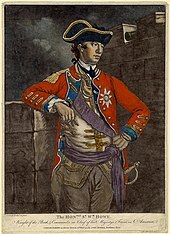 He became known for his role in the capture of Quebec in 1759 when he led a British force to capture the cliffs at Anse-au-Foulon, allowing James Wolfe to land his army and engage the French in the Battle of the Plains of Abraham. Howe also participated in the campaigns to take Louisbourg, Belle Île and Havana. He was appointed Lieutenant-Governor of the Isle of Wight, a post he held until 1795. Howe was sent to North America in March 1775, arriving in May after the American War of Independence broke out. After leading British troops to a costly victory in the Battle of Bunker Hill, Howe took command of all British forces in America from Thomas Gage in September of that year. Howe's record in North America was marked by the successful capture of both New York City and Philadelphia. However, poor British campaign planning for 1777 contributed to the failure of John Burgoyne's Saratoga campaign, which played a major role in the entry of France into the war. Howe's role in developing those plans and the degree to which he was responsible for British failures that year (despite his personal success at Philadelphia) have both been subjects of contemporary and historic debate. He was knighted after his successes in 1776. He resigned his post as Commander in Chief, North America, in 1777, and the next year returned to England, where he was at times active in the defence of the British Isles. He sat in the House of Commons from 1758 to 1780. He inherited the Viscountcy of Howe upon the death of his brother Richard in 1799. He married, but had no children, and the viscountcy became extinct with his death in 1814. Along with fellow British Army Generals Clinton and Burgoyne, Howe arrived at Boston aboard HMS Cerberus on 25 May 1775, having learned en route that war had broken out with the skirmishes at the marches to Lexington and Concord in April. It provided naval reinforcement at the Battle of Bunker Hill. He led a force of 4,000 troops sent to reinforce the 5,000 troops under General Thomas Gage who were besieged in the city after those battles. Gage, Howe, and Generals Clinton and Burgoyne discussed plans to break the siege. They formulated a plan to seize high ground around Boston and attack the besieging colonial militia forces, setting its execution for 18 June. However, the colonists learned of the plan and fortified the heights of Breed's Hill and nearby Bunker Hill on the Charlestown peninsula across the Charles River from Boston on the night of 16–17 June,  forcing the British leadership to rethink their strategy. 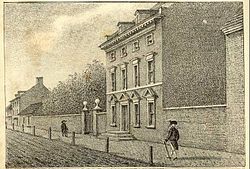 Howe made the Masters-Penn mansion his headquarters during the 1777–78 British occupation of Philadelphia. It later served as the presidential mansion of George Washington and John Adams, 1790–1800. ^ "National Historic Landmarks & National Register of Historic Places in Pennsylvania" (Searchable database). CRGIS: Cultural Resources Geographic Information System. Note: This includes Pennsylvania Register of Historic Sites and Landmarks (August 1971). "National Register of Historic Places Inventory Nomination Form: Gilpin Homestead" (PDF). Retrieved 6 January 2012. ^ "Dead Men Tell No Tales". The Futon Critic. Futon Media. Retrieved 14 March 2016. ^ Frith, Vanessa (5 October 2015). "'Sleepy Hollow' Season 3: Bones Crossover Plot Revealed! How Will Science & The Supernatural Mix [VIDEO]". Enstarz. Retrieved 14 March 2016. Alden, John R. (1954). The American Revolution: 1775–1783. New York: Harper. OCLC 165049515. Alden, John R. (1989) . A History of the American Revolution. New York: Da Capo Press. ISBN 978-0-306-80366-6. OCLC 19846752. Anderson, Troyer (1936). The Command of the Howe Brothers During the American Revolution. New York and London: Oxford University Press. ISBN 978-0-403-00816-2. OCLC 1281930. Boatner, Mark M. (1994) . Encyclopedia of the American Revolution. Mechanicsburg, PA: Stackpole Books. ISBN 978-0-8117-0578-3. OCLC 29595553. Chichester, Henry M (1885–1900). "Howe, William (1729-1814)" . Dictionary of National Biography. London: Smith, Elder & Co.
Cokayne, George Edward (1892). Complete Peerage of England, Scotland, Ireland, Great Britain and the United Kingdom, Extant, Extinct, or Dormant, Volume 4. London: G. Bell and Sons. OCLC 2052386. Fischer, David Hackett (2004). Washington's Crossing. New York: Oxford University Press. ISBN 0-19-518159-X. Fleming, Thomas (2006). Washington's Secret War. New York: HarperCollins. ISBN 978-0-06-082962-9. OCLC 61529854. Fredriksen, John C. (2001). America's Military Adversaries: From Colonial Times to the Present. Santa Barbara, CA: ABC–CLIO. ISBN 978-1-57607-603-3. OCLC 248864750. Griffith, Samuel B. (2002). The War for American Independence: From 1760 to the Surrender at Yorktown in 1781. Urbana, IL: University of Illinois Press. ISBN 978-0-252-02745-1. OCLC 48222590. Hadden, James M.; Rogers, Horatio (1884). A Journal Kept in Canada and Upon Burgoyne's Campaign in 1776 and 1777 by Lieut. James M. Hadden. J. Munsell's Sons. OCLC 2130358. Higginbotham, Don (1971). The War of American Independence. New York: Macmillan. OCLC 142627. Ketchum, Richard M. (1997). Saratoga: Turning Point of America's Revolutionary War. New York: Henry Holt. ISBN 978-0-8050-6123-9. OCLC 41397623. Mainwaring, Rowland Broughton (1889). Historical Record of the Royal Welch Fusiliers. London: Hatchards, Piccadilly. OCLC 220264572. Martin, David G. (1993). The Philadelphia Campaign: June 1777 – July 1778. Conshohocken, PA: Combined Books. ISBN 0-938289-19-5. 2003 Da Capo reprint, ISBN 0-306-81258-4. McGuire, Thomas J. (2006). The Philadelphia Campaign, Vol. I: Brandywine and the Fall of Philadelphia. Mechanicsburg, PA: Stackpole Books. ISBN 978-0-8117-0178-5. Mintz, Max M. (1990). The Generals of Saratoga: John Burgoyne and Horatio Gates. New Haven, CT: Yale University Press. ISBN 978-0-300-04778-3. OCLC 644565187. Pancake, John (1985). This Destructive War. University, AL: University of Alabama Press. ISBN 0-8173-0191-7. OCLC 59831925. Pocock, Tom (1998). Battle for Empire: The Very First World War, 1756–63. London: Michael O'Mara Books. ISBN 978-1-85479-332-4. OCLC 185667821. Syrett, David (2006). Admiral Lord Howe: A Biography. Annapolis, MD: Naval Institute Press. ISBN 978-1-59114-006-1. OCLC 70660963. Trevelyan, George Otto (1898). The American Revolution, Part 1. New York: Longmans, Green, and Co. OCLC 20011020. Willcox, William (1964). Portrait of a General: Sir Henry Clinton in the War of Independence. New York: Alfred A. Knopf. OCLC 245684727. The Edinburgh Annual Register, for 1814. Edinburgh: Archibald Constable. 1816. OCLC 55271916. The Gentleman's Magazine, Volume 116. London: E. Cave. 1814. OCLC 7898058. Smith, David. William Howe and the American War of Independence (London: Bloomsbury, 2015) 201 pp. Moomaw, W. H. "The Denouement of General Howe's Campaign of 1777". English Historical Review (Vol. 79, No. 312 (July 1964)): pp.&nbsp, 498–512. JSTOR 560990. Chisholm, Hugh, ed. (1911). "Howe, William Howe, 5th Viscount" . Encyclopædia Britannica (11th ed.). Cambridge University Press.